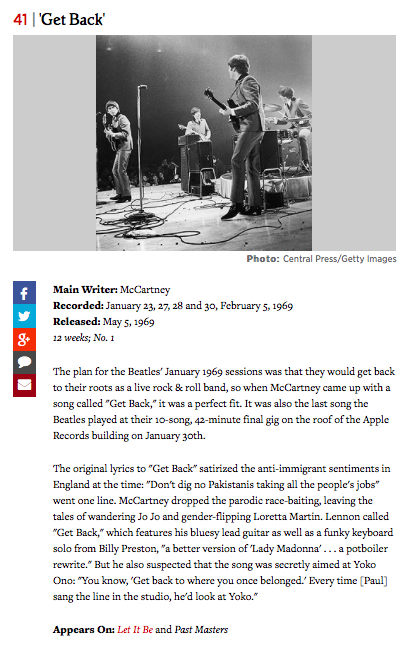 At number 41 in Rolling Stone Magazine’s 100 greatest Beatles songs is “Get Back”, which was released as a single in 1969. I have blogged about this song before here, to celebrate the anniversary of The Beatles’ famous roof-top concert. But, you can’t get too much of a good thing, so I am more than happy to blog about this wonderful song again. Also, the videos of them performing the song during the live roof-top concert do not seem to be available on YouTube anymore (and I’ve tried linking to two separate ones), Apple (The Beatles’ publishing company, not the tech company) keep removing it on copyright grounds. 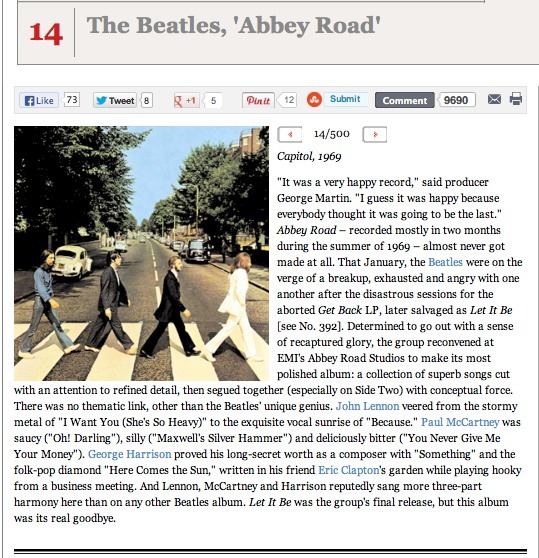 At number 41 in Rolling Stone Magazine’s list of the 100 greatest Beatles songs is “Get Back”. “Get Back” is another example of Paul McCartney at his funky best; it is a wonderful song with such a fantastic driving rhythm from John Lennon’s rhythm guitar. Lennon always felt that it was aimed at Yoko, “Get back to where you once belonged” aimed at the woman whom McCartney maybe felt was coming between the two songwriting friends. I suspect we will never know, as it is not the sort of thing McCartney would ever confess to, but it is clear from the footage in the Let It Be movie that things were pretty strained between McCartney and the other members of the band by this time. As the live version from the roof-top concert keeps getting removed, here is a link to the studio version of the single (which differs from the version on the album). Enjoy! At number 46 in Rolling Stone Magazine’s 100 greatest Beatles songs is “Don’t Let Me Down”, which is on their Let It Be album, and also is one of the songs in their famous January 1969 live concert on the top of the Apple building in London. As is true of much of Lennon’s work at this time, it is both about Yoko and is far more basic rock ‘n’ roll that the complex musical sounds with which he’d been experimenting for the previous several years. “Don’t Let Me Down” was released as the B-side to “Get Back”, which was also performed during the roof-top concert. The released versions of these two songs were both recorded ‘as-live’ in the Apple recording studio in Saville Row (rather than at EMI’s Abbey Road studios), and by ‘as-live’ I mean with minimal to no overdubbing. It was part of an attempt during early 1969 by The Beatles to get back to basics, something which can be seen in the sprawling footage which would eventually become the Let It Be movie. 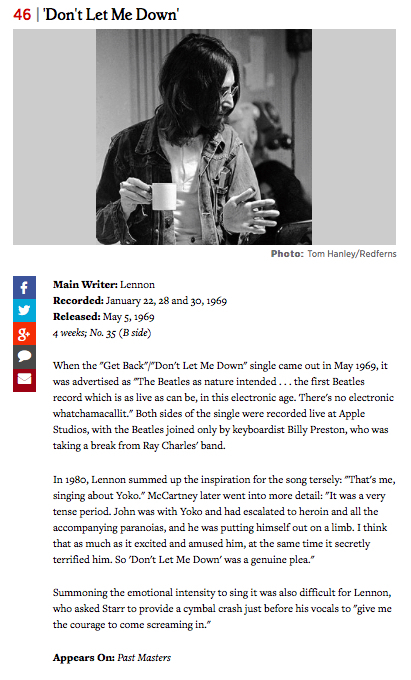 At number 46 in Rolling Stone Magazine’s list of the 100 greatest Beatles songs is “Don’t Let Me Down”. On the face of it, the song’s message seems like a plea to Yoko; Lennon’s relationship with her was still in its early days and he was probably full of insecurities. However, Paul McCartney has put a different slant on the song, claiming that some of Lennon’s apparent paranoia in the song was due to his and Yoko’s increasing use of heroin around this time (the withdrawal from which Lennon sang about in one of his most harrowing solo records – “Cold Turkey”). 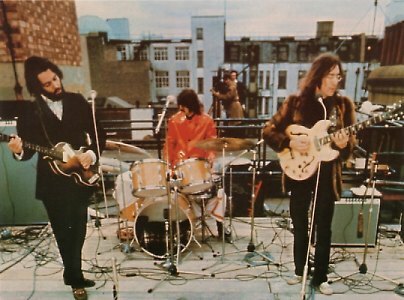 Here are The Beatles performing “Don’t Let Me Down” in their roof-top concert. Enjoy!